China is Apple's fastest growing market, and the company has been busy building new Apple Stores in order to meet demand for its products. The latest store, designed in part by Apple's favored architectural company Foster + Partners, is located in Hangzhou, China's West Lake shopping center and is absolutely stunning. 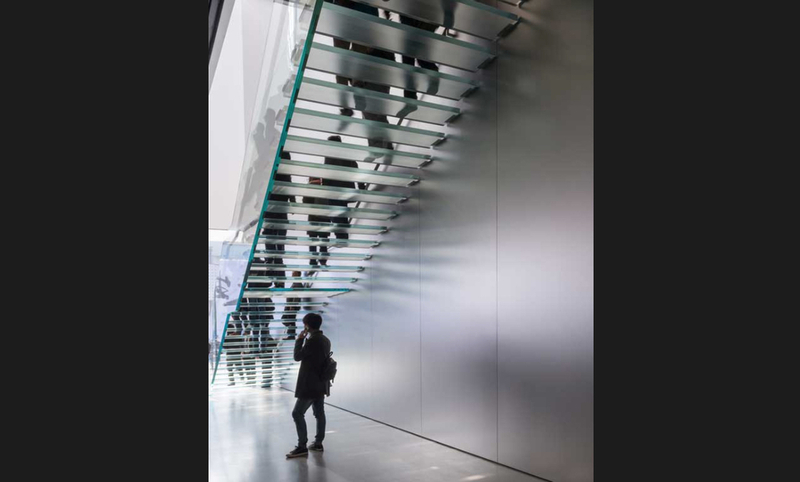 Featuring a 15-metre (49.2 feet) tall glass facade at the front of the store, the West Lake Apple Store is also notable for a "floating" glass staircase up to a second floor. And it's not just any old second floor -- the structure is cantilevered and appears to be floating in mid-air, built with an extremely thin floor complete with tuned mass dampers to reduce vibration. There are hidden window shades that can be revealed to keep outside sunlight from being blinding inside the store, and light panels at the top of the store glow at night, while also acting as an acoustical element to reduce noise. More photos of the store are available on the Apple website, including images taken at the store's opening. There's also an embedded 360° spherical image that provides the feeling of being inside the store. Our take on the news: Apple and Foster + Partners have a wonderful partnership going on, creating structures around the world that are not only beautiful, but also showcases of engineering and architectural prowess. We can't wait to see the inside of Apple Campus 2, under construction now in Cupertino, California.